Red snapper is not always easy to find at the fish store or supermarket. It is a treat when it is in season in late spring. Red snapper is a pretty fish with a rosy red hue to its skin. It is mild in flavor and the flesh is fine yet firm, white, and slightly sweet when cooked. Red snapper is a great fish to add seasonings to because it takes on other flavors easily. It lends itself well to being grilled on a George Foreman Grill. 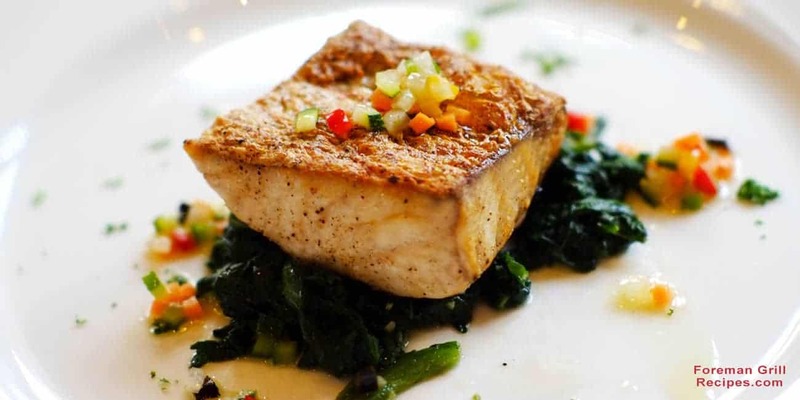 Nutritionally, red snapper is low in calories and high in protein and omega-3 fatty acids. That makes this fish somewhat of a super food. Snapper is an excellent source of potassium and vitamin B-12. Potassium is a necessary mineral and electrolyte for cardiovascular and musculoskeletal health. Potassium helps to balance sodium in our bodies. Without it, we are at higher risk for stroke and high blood pressure. So, eat your fish to keep sodium levels and hypertension in check. Red Snapper is a fish that I always prefer grilled. I like crispy, charred skin on a fish. Snapper skin chars nicely, helping to keep the flesh inside moist. Some people don’t eat the skin. I do. That is why I always ask the fish monger to carefully remove the scales. Snapper has a lot of small scales. So that the filets don’t curl up when the skin tightens during cooking, I will make small scores with a very sharp knife in the skin. However, with the Foreman Grill, I have found that the fish holds its shape fairly well because the top grill plate presses down on the filets and cooks both sides evenly. Scoring the skin is optional here. 1. Brush both sides of the filets lightly with EVOO and season with the paprika, salt, and pepper. Set the fish aside on a plate for a few minutes. 2. Heat your Foreman Grill to medium high. 3. Place the filets on the grill skin side facing down and close the top. Grill for approximately 4 minutes until the fish is opaque and flaky. You can check with a fork. 4. Remove the filets to a plate and serve with lemon wedges. Red Snapper is native to the Gulf of Mexico and nearby regions of the Atlantic Ocean and the Caribbean Seas. What I think goes perfectly with snapper is tostones and a refreshing tropical fruit relish to round out the meal. Tostones are twice cooked green plantains. They are crunchy, starchy, and so good. You can eat them like chips with your fingers. 1. Peel the mango, remove fruit from the pit, and chop into small cubes. Combine with cilantro and lemon juice. This can sit in the refrigerator until the rest of the meal is prepared. This is a simple tostone recipe that you can start to make ahead and finish while the fish is grilling. Just time it correctly. 1. Using a sharp paring knife cut both ends off of each plantain. Then, cut a lengthwise slit along the back of the skin and remove it from the fruit. Cut the plantains crosswise into 1” thick pieces. 2. In a 12 inch cast iron or non-stick skillet, heat 1/2” of oil over moderate heat until it just sizzles when a drop of water is tossed into it. 3. Add the plantains and fry until golden, approximately 2 minutes per side. You will have to do this in batches. Drain plantains on paper towels. Remove skillet from the heat. 4. Place plantains on a sturdy cutting board and smash with a meat mallet to 1/4” thick. 5. Heat another 1/2” of oil in the skillet over moderate heat like before. Refry the smashed plantains (in batches) until crispy for about 2 minutes per side. 6. Drain on paper towels and sprinkle with sea salt while still hot. Serve immediately with fish filets and mango relish. Red snapper is a fresh, wild caught fish that shows up in markets late May. Don’t be fooled by look-alike fish filets. A good fish purveyor will display red snapper in whole fish form so that you know that you are getting the real thing. I recommend purchasing the whole fish. Yes, it might cost you more. Have a close look at it. It should smell clean, not like the sea, and have bright clear eyes. Ask for it to be scaled, boned, cut into filets, and packed in ice. Take the backbones and heads home with you to make a fabulous and healthy fish stock for use in soups and stews. You paid for it, so make good use of it. Here is a good recipe that freezes well.